Three more great games that justify the occasional browsing and buying spree of Xbox indie games. Fellow Moving Pixels writer G. Christopher Williams already has a solid claim to the title of "Flash Game Guru." I can't compete, but perhaps I can try to stake my claim to a similar title, mine involving Xbox indie games. I've written before about some of my favorite indie games on the LIVE Marketplace, so in an attempt to claim my own title, here are three more games from my ever-growing collection of Xbox indie games that I can't get enough of. This is a little game that oozes creativity. 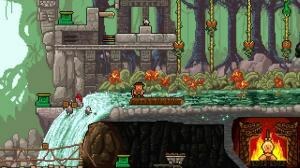 Temple Death has the brutal -- but fair -- platforming of Super Meat Boy mixed with the style of Indiana Jones. You play as an adventurer trying to save “famous starlet Grace Belly” from the wild natives of an unknown jungle. There’s only a single level, but it’s a very big level that’s broken up into several distinct obstacles with a generous amount of checkpoints. The ability to zoom out and see the entire obstacle course is intimidating, but the great level design guides you on a logical path that ensures that you’ll only face one obstacle at a time. The plentiful checkpoints also ensure you’ll never have to replay an obstacle after passing it; this gives the game a strong forward momentum that keeps you playing. The sheer variety of obstacles is impressive: You run from boulders, ride a mine cart, dodge poison darts and spinning blades, even create a laser from the sunlight, and perform several other non-Jones related things. It’s also impressive how you move throughout this single, large level. You don’t take an obvious path, but rather you wind up and down and across and over: starting at the top middle, crossing down to the bottom left, climbing up to the top left before crossing back to the middle, and so on. The fact that this complex path looks impossible from the beginning but becomes intuitive when you’re in the thick of it speaks volumes to the excellent level design. But what’s more impressive is that once you make your way to the middle and save the captive Grace, you have to carry her back through the whole level and the path is just as intuitive. This is the gaming equivalent of a palindrome. You’ll die a lot, but you’ll also get rewards for dying a lot and also for dying very little. The “flopwards” can be hard to get (dying 500 times takes a while), which makes them genuinely rewarding and goes a long way in easing the potential frustration that can stem from this kind of brutal platformer. The only criticism that I can level at this game is that there’s only one level. But it only costs one dollar, and it’s more than worth that price. And if my biggest criticism is that I wish there were more, that’s hardly a bad thing. I’ve already written about Solar 2 at length. Suffice it to say, it’s an excellent game worth every Microsoft space buck. 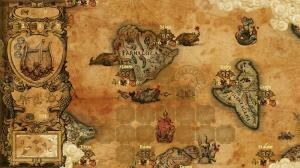 This is a turn-based strategy game styled like an old-timey sea map, complete with sea monsters. Your goal is to defeat the monstrous Ancient Guardian, but to find the creature, you have to first collect three artifacts found at various ports on the map. Other ships have the same goal, so it’s a race to see who can collect the artifacts and defeat the Ancient Guardian the fastest. Thankfully, there’s much more to the game that just racing around looking for artifacts. This is also partly an economic simulator since money lies at the core of everything. The artifacts cost money and upgrading your ship so that it can take on the Guardian, which takes even more money. So you have to go from port to port, buying supplies like tea and fruit at low prices, then traveling to another port to sell them at higher prices. Each port has its own set of fixed prices, so knowing where to buy and where to sell is important. But you won’t know this in the beginning because the map is hidden. You have to explore the world and discover these ports for yourself. The exploration is exciting, especially since sea monsters are an ever present threat, so traveling into uncharted waters is appropriately dangerous. Combat is based on a kind of rock-paper-scissors card game. Each opponent (you and a sea monster or you and one of the other ships) has three cards, red, green, and blue, and each card has a point value associated with it based on how much you’ve upgraded that attack. Each color has a two point bonus when used against a certain other color, so even when you have low numbered cards, you can still win if they’re played in the right order. However, like rock-paper-scissors there’s a random element to the combat that can be annoying, but it can also work in your favor. One thing I still haven’t figured out, though. is what happens when two cards of the same color and level are played against each other; it’s not clear who wins in these situations, whether there’s a system in place that the game doesn’t disclose or whether it’s just a coin flip. There are quests that you can pick up at ports for more money, and random cargo floating in the sea can really boost your wallet since you got it for free. The game offers several different kinds of maps ranging from Beginner to Expert at several different sizes, and the game even includes competitive multiplayer, online and offline. The unique visuals will hook you initially and the wealth of content is staggering, but it’s the depth that’ll keep you coming back to Ancient Trader and wishing there were more people to play an online game with. You can follow the Moving Pixels blog on Twitter.